The Leadership Conference of Women Religious (LCWR), which includes representation from more than 80% of American nuns, is set to hold its annual assembly next week in Nashville. The meeting comes as the organization continues to draw scrutiny from the leadership of the Roman Catholic Church, and also at a time when there has been a steep decline in the number of nuns. The Vatican first began taking a hard look at some organizations of U.S. nuns about five years ago, eventually ordering an investigation and a “doctrinal assessment” of the LCWR – and a plan for organizational reform. More recently, Cardinal Gerhard Mueller, the prefect of the Vatican’s Congregation for the Doctrine of the Faith, criticized the LCWR in an April address before a meeting with the organization and reiterated the Vatican’s intention to require approval for speakers and awardees at LCWR events. In addition to Vatican scrutiny, nuns also face a big challenge in their dwindling ranks. The total number of nuns, also called religious sisters, in the United States has fallen from roughly 180,000 in 1965 to about 50,000 in 2014 – a 72% drop over those 50 years – according to the Center for Applied Research in the Apostolate (CARA) at Georgetown University. While the total number of priests (diocesan and religious) also has fallen over that period, it has done so at a much slower rate (from about 59,000 to 38,000, a 35% drop). 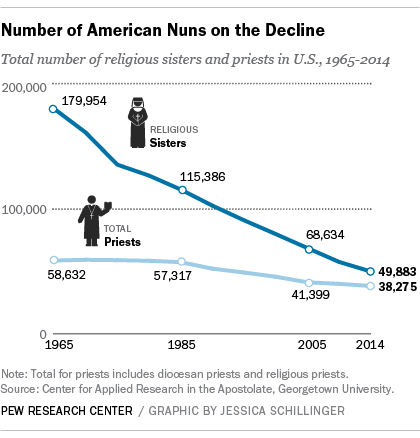 Globally, the number of nuns also is declining, but not nearly as fast as it is in the U.S. In 1970, U.S. nuns represented about 16% of the world’s religious sisters; now, American nuns are about 7% of the global total (just over 700,000), also according to CARA. A separate survey we conducted in 2013 asked U.S. Catholics, in an open-ended question, to name the most important way the church helps society: helping the poor – part of the core mission of the LCWR – or other charitable works, was by far the most popular answer (27%).